NSF/ANSI 49 and BMBL (Biosafety in Microbiological and Biomedical Laboratories) reference the term “Relocated” as the measure of requiring re-certification. Vertical up and down BSC movement on a motorized base stand is not relocation as intended by either of these documents. The height adjustment up and down movement does not cause the vibration necessary to harm or breach the integrity of the HEPA filters. The height adjustment up and down movement is a very slow and smooth movement typical driven by a hydraulic system. If the height adjustment is used in conjunction with an exhausted BSC (i.e. 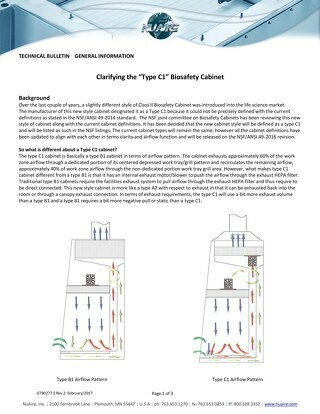 type B1/B2 or canopy connected type A2), the site assessment certification test should include airflow verification throughout the range of motion. 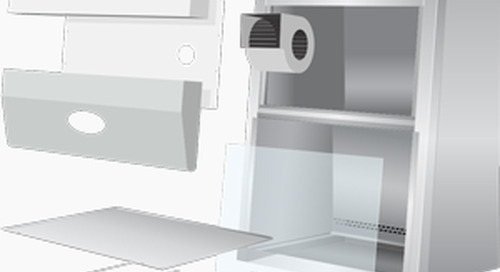 The duct connection itself should be made with flexible PVC duct material. Learn how to set up and run a successful cell culture laboratory by learning topics such as best practices for cell-line validation and considerations for purchasing common cell culture equipment. 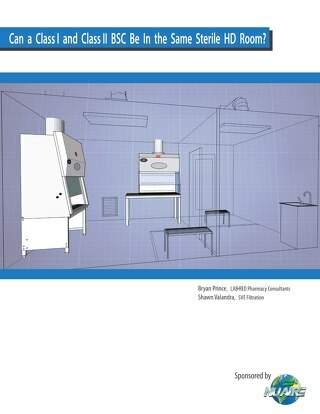 Upon arrival of your Class II Biosafety Cabinet follow these steps for the basic assembly of your cabinet. 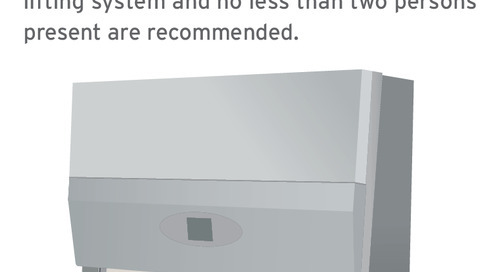 Learn the ideal location to install your Class II, Type A2 Biosafety Cabinet to maximize safety and performance. 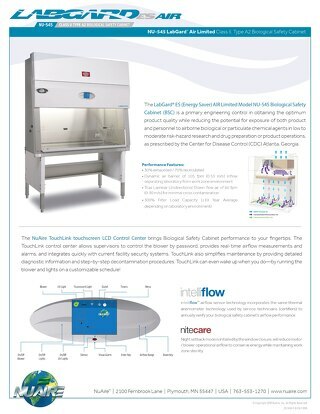 Learn some of the basic about biosafety cabinets (BSC) and how to go about selecting the right bsc for your application. Product flyer for LabGard AIR Limited 230-volt Class II Biosafety Cabinet (BSC) model NU-545E. 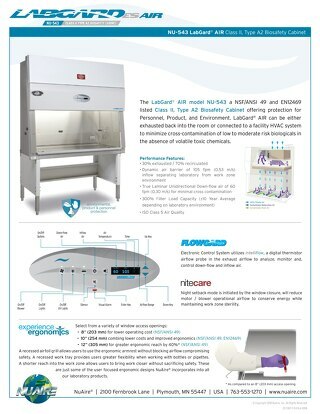 Product flyer for LabGard AIR Limited Class II, Type A2 Biosafety Cabinet (BSC) model NU-545. 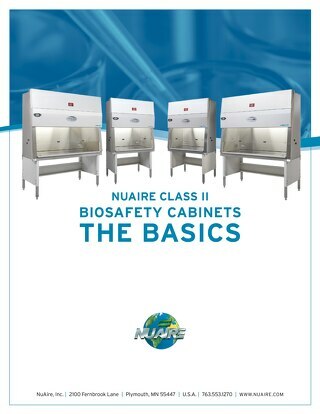 Learn the basics of how NuAire Biosafety Cabinets (BSC) are designed to offer optimal personnel, environmental and product protection. 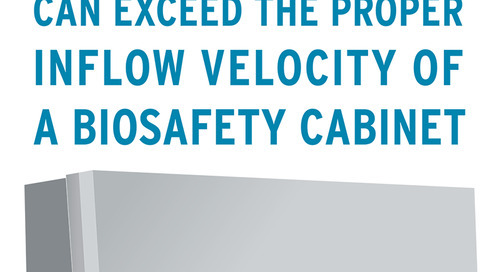 Learn the Biosafety Cabinet Decommissioning Process with this infographic. 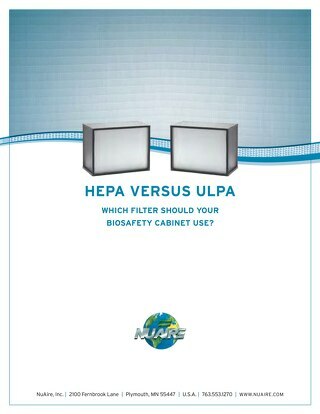 HEPA versus ULPA filters, what makes the most sense in a biosafety cabinet. 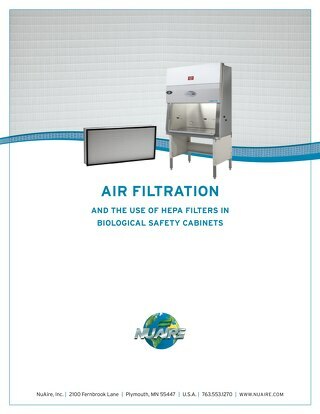 Learn about the use of HEPA filters in biosafety cabinets.  This e-book focuses on the common types and structures of BSCs, particularly Class II Biosafety Cabinets, and what lab managers should know. 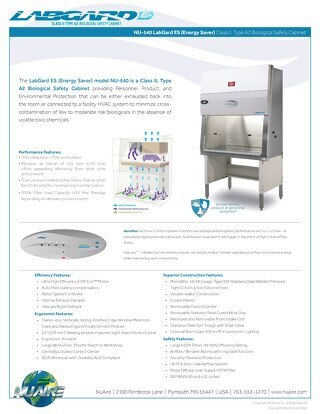 The LabGard model NU-540 is an NSF/ANSI 49 listed Class II, Type A2 Biosafety Cabinet providing personnel, product, and environmental protection. 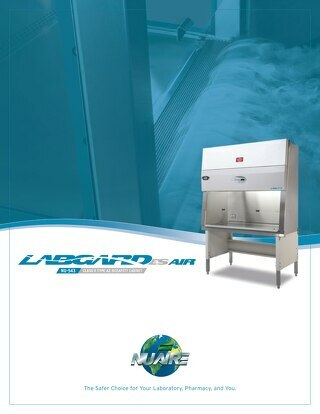 LabGard AIR Model NU-543 Class II, Type A2 Biosafety Cabinet provides long lasting personnel, product, and environmental protection through advanced construction techniques and electronic controls. 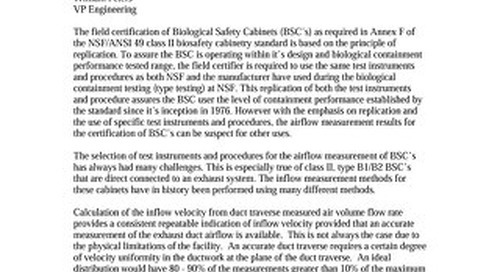 The Class II, Type C1 Biosafety Cabinet (BSC) is similar to a Type B1 regarding airflow pattern. The Type C1 has a portion of the work surface to exhaust air. 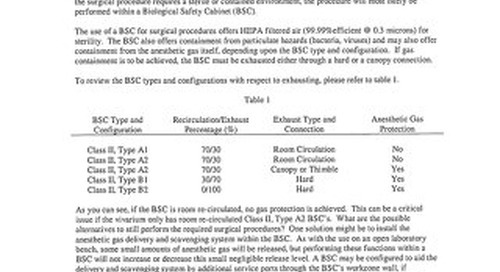 [White Paper] Can a Class I and Class II BSC be in the same Sterile Hazardous Drug (HD) Room? 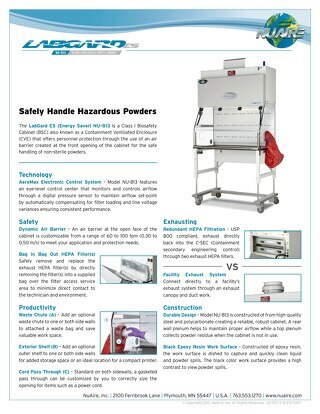 USP 800 does not directly address the pre-sterilization process of a sterile preparation creating the question can a class I and a Class II biosafety cabinet be used in the same sterile HD room?